There have been many wars since 1945, from the Korean War in the 1950’s to the present-day unrest in the Middle East. Here are some stories – both true and fictional – that can help us imagine the lives of other people. Alabed, Bana. 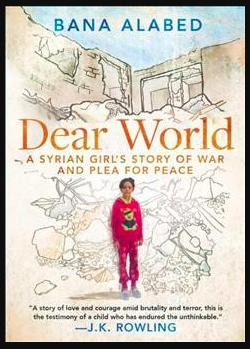 Dear World: A Syrian Girl’s Story of War and Plea for Peace. New York: Simon & Schuster, 2017. In the news, we hear of the civil war in Syria. On television, we see pictures of the devastated cities. But what is it like to be a child living in the midst of all that chaos? In September of 2016, a seven-year-old girl started telling the world using a Twitter account. And now, in this book, she tells more about her family’s journey from peaceful hope to constant fear. Interspersed with sections providing background information written by her mother, Bana describes a happy childhood that turns into a nightmare that only begins to end when the family flees to Turkey. Al-Windawi,Thura. Thura’s Diary. New York: Puffin, 2004. Thura was nineteen years old when the Americans invaded Baghad, Iraq. She had been studying to be a chemist but now she had to stay home. And after the war, life did not improve even though Saddam Hussein was no longer in power. 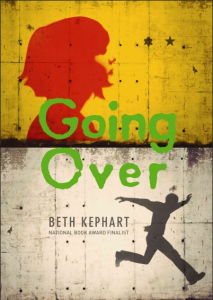 This autobiographical account is recommended for readers 12 years old and up. Almond, David. Raven Summer. Delacorte Press, 2008. All of Almond’s novels are for readers with speculative minds. “What if. . .” is always the question that changes the course of what might have been a straight-forward realistic novel. And in this novel, the question is “What if an abandoned baby leads to children who have lived through horrific acts of war? What shall we do? Send them back to their nightmares?” Since Almond is a British writer, some of the references will not be familiar to Canadian students. Nevertheless, this story full of surprises will intrigue readers aged eleven and up. Banks, Lynne Reid. Broken Bridge. London: Hamish Hamilton, 1995. Two fourteen-year-olds, recently arrived in Israel walk unsuspectingly thorough the streets of Jerusalem. Two men jump out of a doorway and pounce on them. A few agonizing seconds later, one of the teenagers lies dead from he stab of a terrorist’s knife. Barakat, Ibtisam. Tasting the Sky: A Palestinian Childhood. Farrar, Straus and Giroux, 2007. Bell, William. 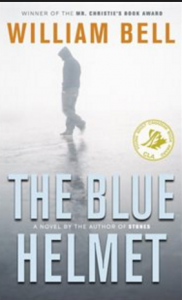 The Blue Helmet. N.p. : Doubleday Canada, 2006. Bell, William. Forbidden City. Doubleday Canada, 1990. Bondoux, Anne-Laure. 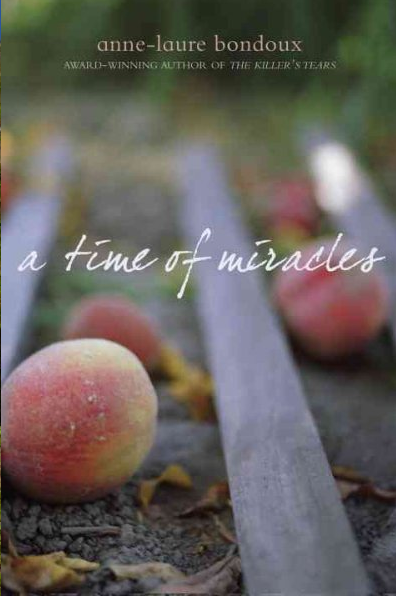 A Time of Miracles. New York: Delacorte Press, 2010. Bunting, Eve. Gleam and Glow. Toronto: Harcourtbooks, 2001. 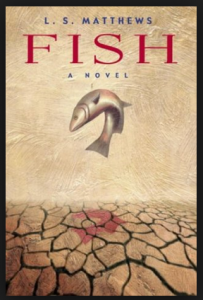 After his home is destroyed by war in Bosnia-Herzegovina, eight-year-old Viktor finds hope in the survival of two very special fish. This picture book is based on a true story. Bunting, Eve. Walking to School. New York: Clarion Books, 2008. 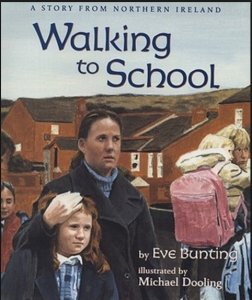 In this picture book set in Belfast, Ireland, eight-year-old Allison has to walk through a Protestant neighbourhood to get to her Catholic school. Carmi, Daniella. Samir and Yonatan. New York: Scholastic, 2000. Two injured boys, one Palestinian and one Jewish, find themselves side by side in the same Israeli hospital. Slowly, together with the other patients in the children’s ward, they overcome their fears and form an unexpected friendship. Carter, Anne L. The Shepherd’s Granddaughter. Toronto: Groundwood, 2008. Amani, a Palestinian girl, lives with her extended family in a small village. After her beloved grandfather dies, Israeli settlers intrude upon their land. Some family members want to fight back, others say to be more patient and Amani has to decide upon her own future. Clinton, Cathryn. A Stone in My Hand. Candlewick Press, 2004, c2002. Coates, Jan L. A Hare in the Elephant’s Trunk. Red Deer Press, 2010. Collins, Suzanne. Year of the Jungle: Memories from the Homefront. New York : Scholastic Press, 2002. Combres, Elisabeth. Broken Memory. Groundwood Books, 2007. 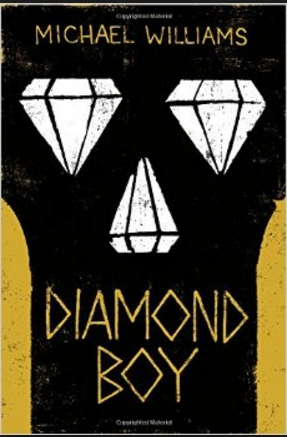 Cooney, Caroline B. Diamonds in the Shadow. Delacorte, 2007. Dowd, Siobhan. Bog Child. New York: Random House, 2008. 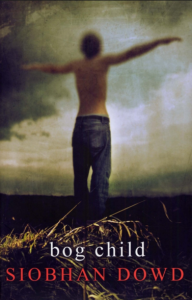 In 1981, the height of Ireland’s ‘Troubles,’ eighteen-year-old Fergus is distracted from his upcoming A-level exams by his imprisoned brother’s hunger strike, the stress of being a courier for Sinn Fein, and dreams of a murdered girl whose body he discovered in a bog. (CIP) For mature readers only due to subject matter. Ellis, Deborah. No Safe Place. Groundwood Books/House of Anansi Press, 2010. Ellis, Deborah. The Breadwinner. Vancouver: Douglas & McIntyre, 2000. Because the Taliban rulers of Kabul, Afghanistan, impose strict limitations on women’s freedom and behavior, eleven-year-old Parvana must disguise herself as a boy so that her family can survive after her father’s arrest. (OhioLINK) There are two more books in this series: Parvanna’s Journey and Mud City. 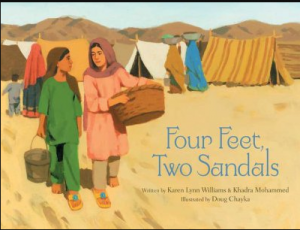 Parvana, in Parvana’s Journey by Deborah Ellis (Douglas and Mclntyre, 2001), is a teenage girl whose father is dead and her mother and siblings are on the other side of Afghanistan. Parvana feels miserable hungry, tired, and scared. Has she been the cause of all the problems that have been happening to her and her family? She comes across an abandoned baby child in an old village. A few days later she comes across an old cave with a young boy with one leg in the middle of the desert, Parvana feels responsible for those kids, so after a little thinking she takes them with her on her journey to find her family. Will she be able to take care of herself and the two boys? Will she find her family in one piece? Will she even survive in the desert? Read this fascinating novel of adventure and survival to find out! Ellis, Deborah. Three Wishes: Palestinian and Israeli Children Speak. Groundwood Books, 2004. Ellis, Deborah. 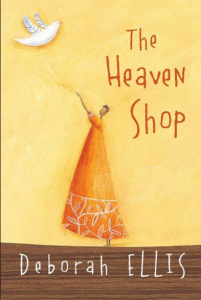 The Heaven Shop. Toronto: Fitzhenry & Whiteside, 2004. Binti and her siblings are orphaned when their father dies of AIDS. Split up and sent to relatives all over Malawi, they suffer increasing hardship until they are reunited through the influence of their formidable grandmother. (OhioLINK) For mature readers due to the subject matter. Filipovic, Zlata. 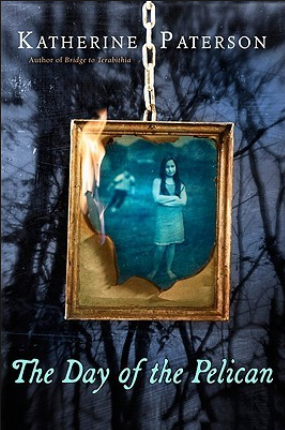 Zlata’s Diary : a Child’s Life in Sarajevo. New York: Scholastic, 1994. This autobiography contains excerpts from the author’s diary which she began during the siege of Sarajevo when she was eleven years old. Foreman, Michael. 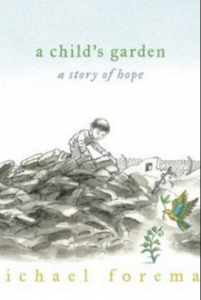 A Child’s Garden: a Story of Hope. Candlewick Press, 2009. Gibbons, Alan. Caught in the Crossfire. Orion Children’s Books, 2003. Set in England, this suspense-filled novel shows what happens when the brother of a member of The Patriotic League starts secretly seeing a British Muslim girl. 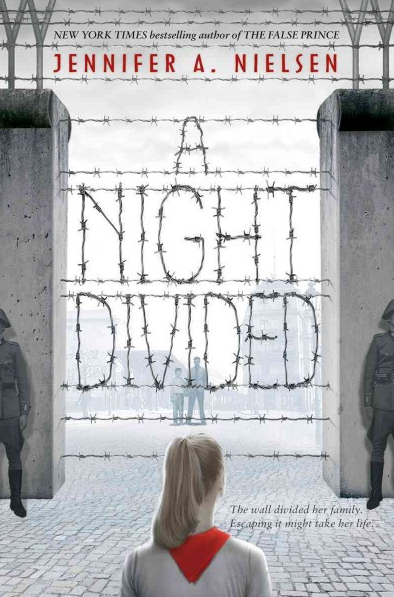 Fear, prejudice, pride and violence all combine to create a compelling novel for young adults. Halilbegovich, Nadja. Childhood Under Fire. Toronto: KidsCanPress, 2008. Illustrated with black and white photos, this is the diary of twelve-year-old Nadja who survived three years of war during the 1990s in Sarajevo. Haworth, Danette. Me & Jack. New York: Walker & Co., 2011. Heneghan, James. Safe House. Victoria, B.C. : Orca Book Publishers, 2006. Hof, Marjolijn. Against the Odds. Toronto: Groundwood, 2006. 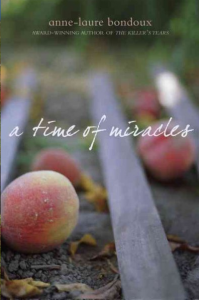 Translated from German, this short award-winning novel tells the story of Kiki, whose father disappears while on a medical mission to help people in a war zone. Humphries, Jessica Dee and Michel Chikwanine. 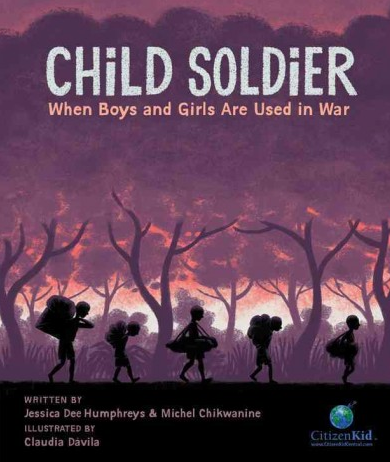 Child Soldier: When Boys and Girls are Used in War. Toronto: Kids Can Press, 2015. This graphic novel tells the true story of author Michel Chikwanine who came to Canada from the Democratic Republic of Congo in central Africa when he was 16 years old. 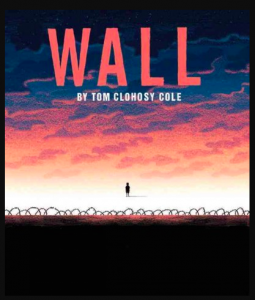 Additional information and suggested resources for further research accompany this powerful autobiography recommended for readers 11 years old and up. Jiang, Hi Li. Red Scarf Girl. Toronto: Scholastic, 1997. In this memoir of the Chinese Cultural Revolution, the author tells of her young teen years when family members turned against each other, homes were searched by soldiers, and millions of people were imprisoned or killed. Kalman, Bobbie. Refugee Child. St. Catherines, On. : Crabtree, 2006. In this memoir of the 1956 Hungarian Revolution, the author describes seeing truckloads of dead and wounded people as she walked home from school one day. Soon, her family was on the run, crossing muddy fields and freezing water, hoping to escape the dogs and gunshots, hoping to get across the border to Austria. Kephart, Beth. Going Over. San Francisco: Chronicle Books, 2014. Khan, Rukhsana. 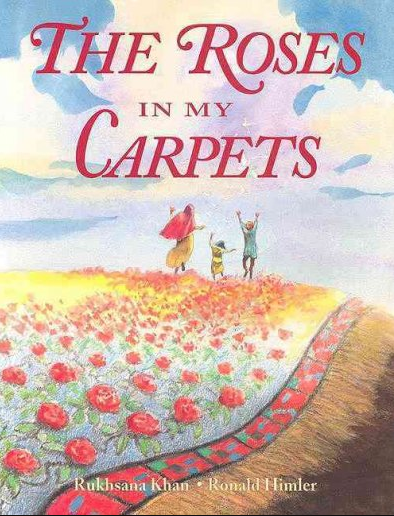 The Roses in My Carpets. Markham, Ont. : Fitzhenry & Whiteside, 2004, c1988. Khan, Rukhsana. Wanting Mor. Toronto: Groundwood Book, 2009. “Jameela feels relatively secure, sustained by her Muslim faith and the love of her mother, Mor. But when Mor dies, Jameela’s father impulsively decides to start a new life in Kabul where Jameela ultimately becomes an orphan after being abandoned in a busy marketplace by her father and stepmother. With only the memory of her mother to sustain her, Jameela finds the strength to face those who abandoned her when fate brings them together again.” – NVPL. Lai, Thankha. Inside Out and Back Again. HarperCollins, 2011. A ten-year-old girl tells of the journey she, her three brothers and her mother make from Vietnam to their new home in Alabama in 1975 after the fall of Saigon. Laird, Elizabeth. The Garbage King. Macmillan Children’s Books, 2003. Laird, Elizabeth. Oranges in No Man’s Land. London: Macmillan Children’s Books, 2006. Levine, Kristin. The Paper Cowboy. New York: G. P. Putnam’s Sons, 2014. Maes, Nicholas. Crescent Star. Dundurn Press, 2011. Mankell, Henning. Secrets in the Fire. Richmond Hill: Annick Press, 2003. 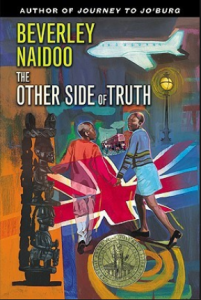 This novel is based on the true story of an young girl living in war-torn Mozambique who has to flee with her family through a jungle planted with landmines. Mankell, Henning. Shadow of the Leopard. Toronto: Annick, 2007. At the age of nine, Sofia lost her legs in a landmine explosion. She still lives in a village in Mozambique and is now expecting her third child. Her beloved Armando works in the city and comes home on Saturdays. Life is hard, but things become much worse when, one weekend, Armando does not return. (back cover) This sequel to Secrets in the Fire is for mature readers only due to subject matter. Mazer, Harry and Peter Lerangis. Somebody Please Tell Me Who I Am. New York: Simon & Schuster Books for Young Readers, 2012. Matthews, L.S. Fish. New York : Delacorte, 2004. Tiger and his parents have to leave the village where they have been working. A drought is drying up the land, war is approaching, and their only hope is to escape across the mountains. So they set out with a guide. But events become more and more mysterious after Tiger finds a little fish in a mud puddle and determines to keep it alive until they all reach safety. This short but sophisticated story is for readers with imagination eleven years old and up. McCormick, Patricia. Never Fall Down. New York : Balzer + Bray, 2012. McCormick, Patricia. Purple Heart. New York: Balzer + Bray, 2009. 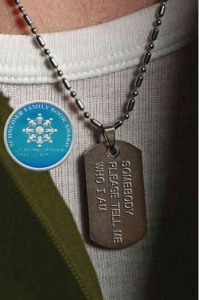 While recuperating in a Baghdad hospital from a traumatic brain injury sustained during the Iraq War, eighteen-year-old soldier Matt Duffy struggles to recall what happened to him and how it relates to his ten-year-old friend Ali. (CIP) For mature readers only due to subject matter and language. McKay, Sharon E. War Brothers. Toronto: Puffin Canada, 2008. Myers, Walter Dean. Patrol: An American Soldier in Vietnam. New York: HarperCollins, 2002. 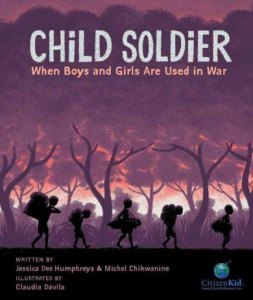 A frightened American soldier faces combat in the jungles of Vietnam in this picture book illustrated with collages. Myers, Walter Dean. Sunrise over Fallujah. New York : Scholastic Press, 2008. Naidoo, Beverly. Burn My Heart. Amistad, 2009, c2007. Naidoo, Beverley. The Other Side of Truth. London: Puffin Books, 2000. Smuggled out of Nigeria after their mother’s murder, Sade and her younger brother are abandoned in London when their uncle fails to meet them at the airport; they are fearful of their new surroundings and of what may have happened to their journalist father back in Nigeria. Nielsen, Jennifer A. A Night Divided. New York: Scholastic Press, 2015. O’Brien, Tony. Afghan Dreams. New York: Bloomsbury Children’s Books, 2008. Oron, Judie. Cry of the Giraffe. Toronto: Annick Press, 2010. Park, Frances. My Freedom Trip: A Child’s Escape from North Korea. Honesdale, (Penn. ): Boyds Mill Press, Inc., 1998. Parry, Rosanne. Heart of a Shepherd. New York: Random House 2009. Paterson, Katherine. The Day of the Pelican. Boston: Clarion Books, 2009. Paterson, Katherine. Park’s Quest. Markham, On. : Penguin, 1988. Eleven-year-old Park wants to find out more about his father who was killed in combat in Vietnam. When he spends several weeks with his grandfather, he learns more about his father than he’d expected and discovers a half-sister whose mother is from Vietnam. Rumford, James. Silent Music: A Story of Baghdad. New York: Roaring Brook Press, 2008. In this picture book for adolescents, bombs and missiles fall on Baghdad while a boy uses the art of calligraphy to emotionally distance himself from the fighting. Please tell Luisa of Eighth Grade that her essay on my SILENT MUSIC was one of the most thoughtful and well-presented I have ever read. Thank you for posting what she wrote. Ruth, Greg. Coming Home. New York: Feiwel and Friends, 2014. Sis, Peter. The Wall. New York: Frances Foster Books, 2007. Stratton, Allan. Chanda’s Wars. Toronto: HarperCollins, 2008. Chanda Kabelo, a teenaged African girl, must save her younger siblings after they are kidnapped and forced to serve as child soldiers in General Mandiki’s rebel army. This vivid fictional account is for mature readers only due to the subject matter. Tilly, Meg. Porcupine. Toronto: Tundra Books, 2007. Walters, Eric. Shattered. Toronto: Puffin Canada, 2008.A teenage boy from a wealthy home, volunteering in a poor area of Vancouver, B.C. in order to meet high school graduation requirements, meets a homeless soldier who has returned from the massacre in Rwanda and learns about the plight of victims of war. Includes a forward by Lieutenant General Romeo Dallaire. Walters, Eric. We All Fall Down. Toronto: Seal Books, 2006. 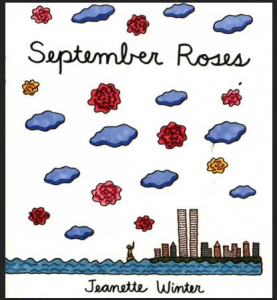 Will, a ninth-grader, spends September 11 at his father’s workplace in New York City. 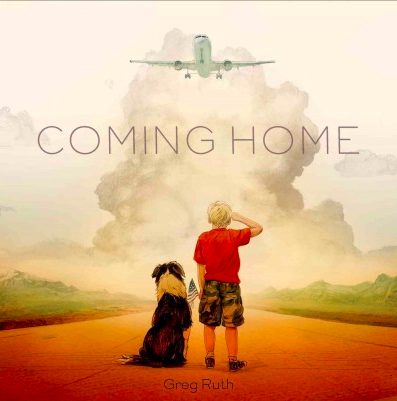 He thinks his father won’t have much time for him, but everything changes when a plane flies into the building and the two of them have to escape. Walters, Eric and Adrian Bradbury. When Elephants Fight. Victoria: Orca, 2008. Whelan, Gloria. The Disappeared. New York: Dial Books, 2008. What if you are trying to save your brother who has been kidnapped? What will you do if the kidnappers are part of the 1970s government in Argentina? Williams, Karen Lynn and Khadra Mohammed. Four Feet, Two Sandals. Grand Rapids, Mich. : Eerdmans Books for Young Readers, 2007. Williams, Michael. 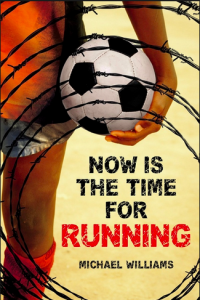 Now Is the Time for Running. New York : Little, Brown, 2013, c2009. Winter, Jeannette. Nasreen’s Secret School. New York: Beach Lane Books, 2009. Winter, Jeanette. September Roses. New York: Farrar Straus Giroux, 2004. 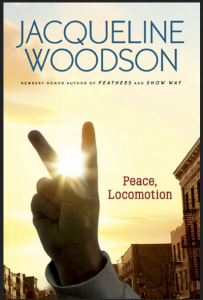 Woodson, Jacqueline. Peace, Locomotion. New York: G.P. Putnam’s Sons, 2009. Ye, Tian-xing. My Name is Number 4. N.p. : Random House of Canada, 2008. This is the true story of a girl during the Chinese Cultural Revolution, a teenager who endured hunger, poverty, attacks by the Red Guards and even exile on a farm prison far from home. Zenatti, Valerie. A Bottle in the Gaza Sea. Bloomsbury Publishing, 2008. Tal, a teenager in Tel Aviv, throws a bottle in the sea after witnessing a bombing. 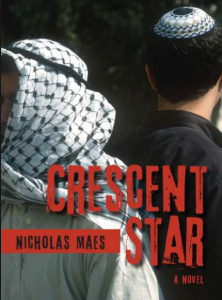 Soon, she receives an email message from a Palestinian young man and slowly, a friendship develops between them. Click HERE for more stories of refugees due to recent conflicts.